Home | Discount Leotards ™ > Grips, Grip Bags, Balm, Etc. 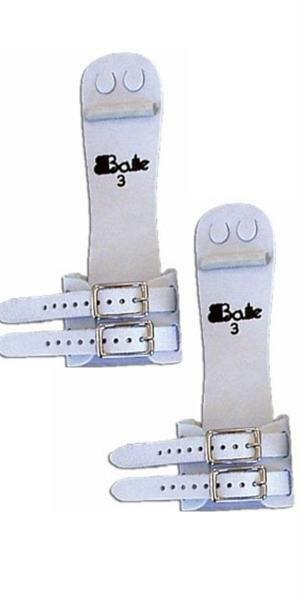 > Bailie double buckle regular width ladies uneven bar grips (1 pair). Bailie double buckle regular width ladies uneven bar grips (1 pair). ALL GRIPS ARE SOLD PER PAIR. Don't forget to purchase wristbands or wrist neoprene with your grip purchase. Please read about more information on thebreaking-in and care of your new grips. Bailie Double Buckle Dowel Grips! The 302DB is a double buckle grip in a standard width. This grip has two straps that can each be adjusted to the gymnast’s preference. This grip is recommended for higher-level gymnasts, and ones that have worn grips before. We do not recommend this grip for the first time dowel grip user. Available in sizes 00- 5. Get the security of a buckle!! The palm piece has a leather wrist band sewn onto the grip. The dowel is glued and sewn onto the grip. Bailie - setting the standard! Made in the U.S.A.